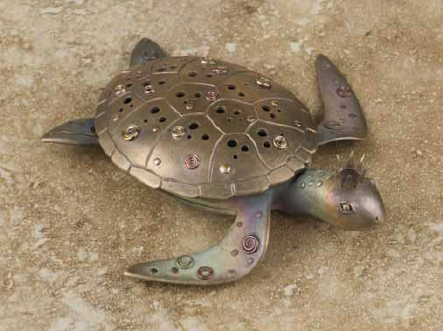 Do you know Gordon Uyehara's work in metal clay? If not...what are you waiting for? Run, don't walk, to get a copy of this new book. 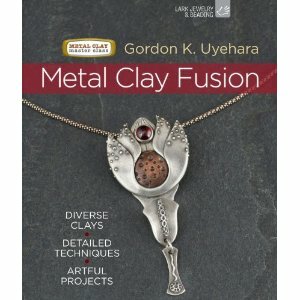 Metal Clay Fusion is the first book in a new series by Lark publications called Metal Clay Master Class series, and it's a winner! Reviewers everywhere agree: Gordon has a way of making complex issues clear even while creating metal clay pieces of stunning complexity and beauty. Fully one half of the book is devoted to the technical aspects of metal clay, covering every skill needed in working the the various metal clays - silver, gold, copper, and bronze. Two of my favorite sections are "Thinking in Parts" and "Construction Issues". Too often in how-to books, the issues of good design and trouble-shooting are given a back page approach. Since metal clay is still so new and there are so many conflicting instructions on how to best handle it, this technical emphasis is very very welcome. Whether you are a motivated beginner or have been working with metal clays for awhile, you'll definitely want this fantastic resource. The entire book is liberally sprinkled with images of Gordon's inspiring work, but the project section of the book is just jaw-dropping. It's easy to see why Gordon was chosen to be a Saul Bell award winner!